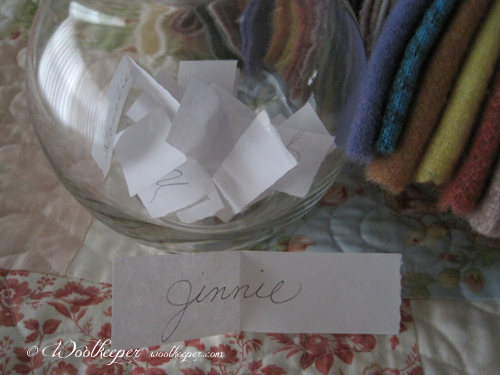 The winner of the Giveaway is Jinnie! Congratulations Jinnie! Send me an email with your choice of kit and your address and I'll put it in the mail tomorrow. Jinnie was right about who is my drama queen doggie. It is 100% Em, all the way. She is so melodramatic and quite the handful. Finding a comfortable spot is her forte. 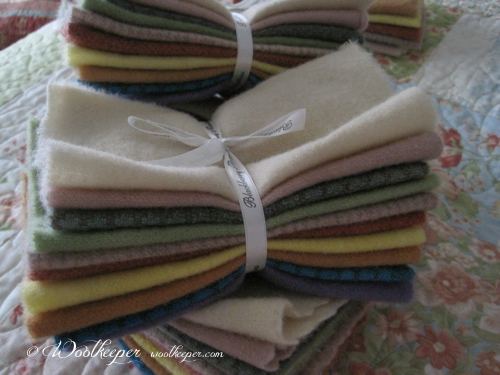 I have some new wool bundles on the Woolkeeper® site. This gorgeous wool is from Blackberry Primitives. The bundle has ten different colors and textures. Each piece is approximately 7" x 8". The group is called Vintage Petals and is prefect for springtime projects. 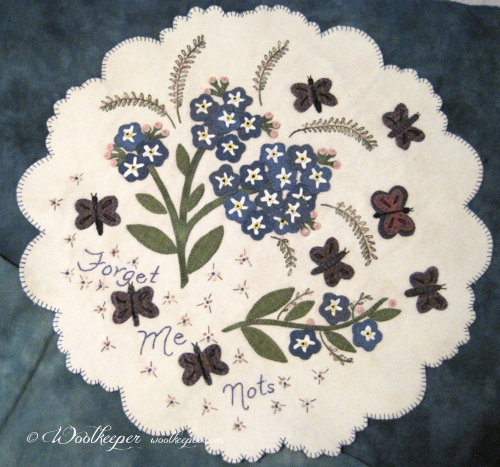 Also a pattern for an 18" Round Forget-Me-Not Mat called Prettiest Little Blooms. Hope you find time to stitch this weekend. I enjoyed a great Friday Night with Friends hosted by Cheryll from Gone Stitchin. 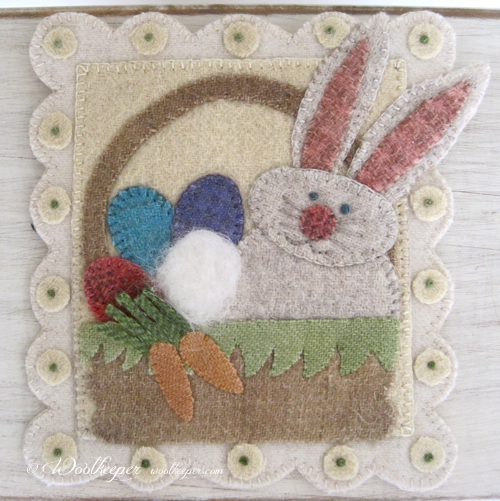 I finished up the stitching on a 6" x 6 1/2" banner I named Mr. Fluffles. 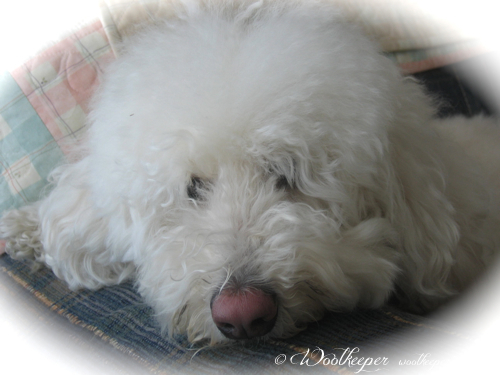 I loved using wool roving on his tail. Happy Stitching Friday Night Friends. 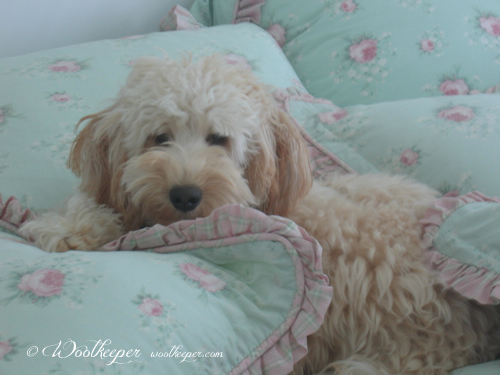 Is there something on the Woolkeeper site that you would really like? To get a chance to win it, all you have to do is leave a comment on this post telling me what kit you would like. You can get another chance to win if you also comment on a kit you enjoyed and have either completed or are working on right now. 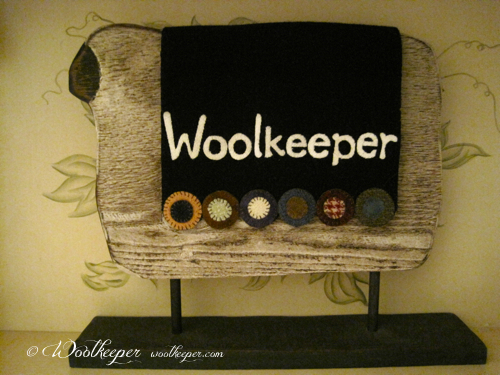 This Woolkeeper giveaway will close on next Wednesday, April 9th at midnight CT. I will randomly pick the winner on April 10th. Looking forward to the comments. 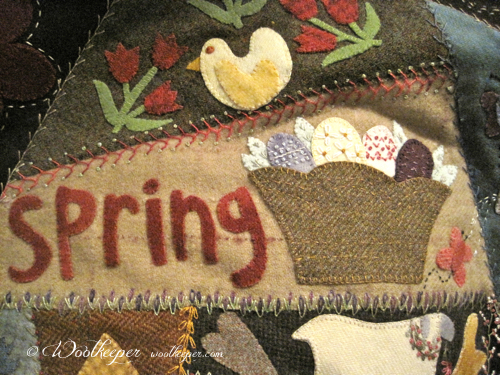 I had a great beginning wool applique group last weekend at Prairie Stitches Quilt Shop. The ladies were fabulous and are now official woolies. 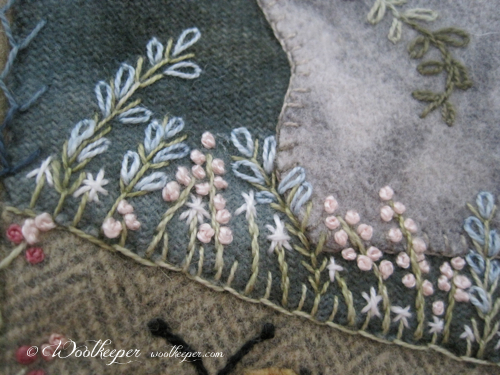 I love to start stitchers on their adventure with wool applique. Two ladies drove 2 hours to get to the class. I wish I could have made them dinner before they left for their journey home. Thanks to all the ladies for a great stitching time together. 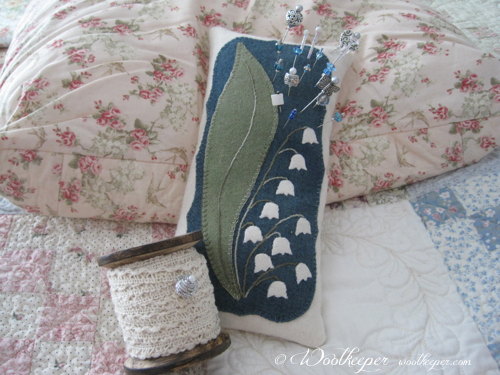 We worked on the Coneflower Needle and Pin Keeps. Kits for pink coneflowers on brown background and bluish-purple coneflowers on off white background are on the site. 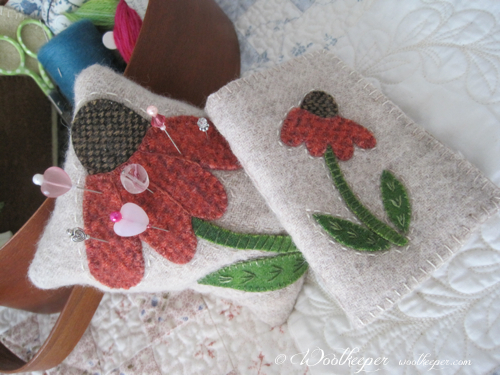 I have added 3 more Blackberry Primitive patterns designed by Kay Cloud on the Woolkeeper site under patterns by other designers. The Rabbits and Carrot pattern is so cute. 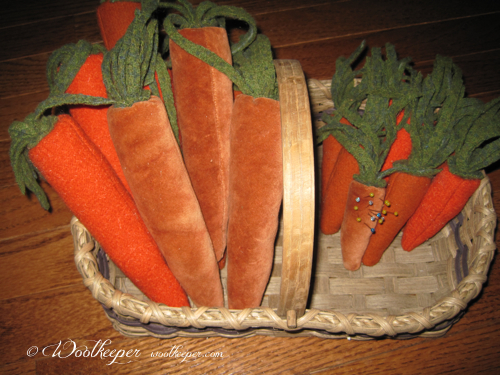 I made some of the carrots in wool and some in cotton velvet. They're going to be fun additions to Easter baskets. The pattern has bunnies, too. I'm working on one in gray wool. It was a hoot to use one of the little carrots for a pin keep this week. There is also a pattern for Birds of a Feather and darling lambs called Lambswool. Think I'll do the birds in velvet and the lambs in wool. Lilies of the Valley are one of my favorite flowers. I adore the delicacy of the little white bells. I can't wait for them to bloom this year after our brutal winter. I always put a mason jar of them on the kitchen table so we can enjoy their special fragrance. I like a big pin keep on my cutting table so I recently made this large pin keep. It's 4 1/2" x 9". I'll put together a few kits for those who like super sized pin keeps. 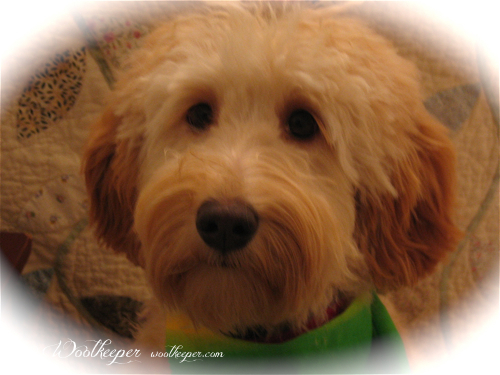 It's birthday week for my furry kids. Em is 9 and Bit is 12. I'll put in another chance for you to win the giveaway if you can tell me which of these doggies is a drama queen:) Happy Birthday to my loyal and faithful everyday stitching pals. Woof.